Lee Da-hee is an actress from South Korea. At the age of 17, she was a finalist of the Super Elite Model Contest in 2002. Her acting career began with a minor role in dramas, including Sad Love Story, The Legend, and Birdie Buddy. She rose to fame through her role as Prosecutor Seo Do Yeon in I Can Hear Your Voice. She acted together with Lee Jong-suk and Lee Bo-young. She received a New Star Award at the 2013 SBS Drama Awards for her role. Lee Da-hee had her first lead role in the drama Big Man. She acted as So Mi-ra, the daughter of the chauffeur of Hyunsung Group, and manager of the in-house staff. She was awarded Popularity Award for Actress at the 2014 KBS Drama Awards for her role in the drama. Lee Da-hee’s latest drama is Queen of Mystery 2 along with Kwon Sang-woo and Choi Kang-hee. This drama was her first in three years, since Mrs. Cop in 2015. She played Jung Hee-yeon, who was a pastry chef and successful businesswoman who owns a chain of cake stores. Her character helped the main lead to solve mysteries. Lee Da-hee has been offered a role in JTBC’s new drama entitled The Beauty Inside. Her agency said that she was positively considering the offer. The Beauty Inside will be a remake drama of a movie with the same title. The main lead is reported to be Seo Hyun-jin and Lee Min-ki. The drama is expected to air sometime in the latter half of 2018. In 2013, the old photos of Lee Da-hee became a trending topic in online community forums. The photos were taken in her teenager years. Netizens were surprised by the different looks. 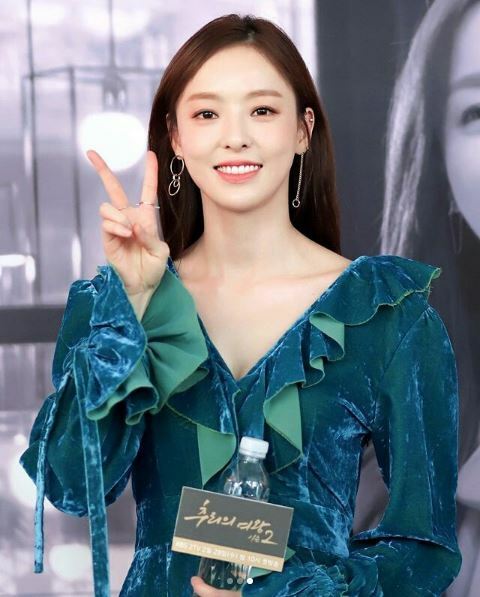 They said that it was hard to recognize the resemblances with the current Lee Da-hee’s appearances in the first glance. Netizen thought that the differences due to mix of weight loss, eye, nose, jaw and dental surgery. However, some of her distinctive facial features appear to be the same. Let’s Take a Look at Jang Shin-young and Kang Kyung-joon’s Romantic Wedding Photos!